In an age of globalisation and constant economic development, the Club of Notes considers itself accountable towards the environment and society. The economic success and sustained growth of the Club of Notes has created an ever greater obligation to support the member businesses within, looking to the future and acting accordingly. With an ever-present awareness of social and ecological responsibilities and a vigilant approach towards customers, suppliers, shareholders, staff and the environment as a whole. As a specialist producer of paper based, promotional products, the Club of Notes focus on the environment is a major principle. 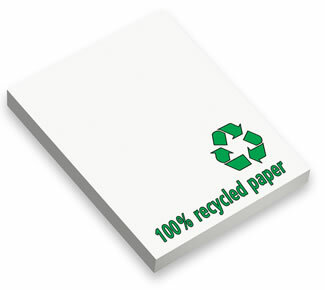 A range of 100% recycled papers are available and all sticky note products are coated with a water-based adhesive, thus eradicating solvents from the production process. The Club of Notes cooperates extensively with paper suppliers who apply clear ecological and ethical principles, are themselves committed to the environment and obtain their raw materials from environmentally friendly and sustainable forestry. In short, the Club of Notes cares about the world we live in and takes steps to ensure that the way in which products are produced can be sustained, with minimal impact on the environment. The FSC symbol is a powerful indication of commitment towards the environment by both the printers who produce the products bearing the FSC mark and the customers who purchase them. All of the Club of Notes paper grades are available with an FSC accredited option, thus providing its members and their customers with the opportunity to tell the world that they support the highest social and environmental standards. Purchase of FSC certified paper and related printed products contributes to conservation, responsible forestry management and the support of the people who work within the forestry community. All Club of Notes members have access to an Environmental Awareness Programme, via which they are able to combine the environmental credentials of paper supplied by the Club with the local environmental initiatives undertaken within their own organisations. The Club of Notes cares about the world we live in and takes steps to ensure that the way in which products are produced can be sustained, with minimal impact on the environment.